An investigation is underway after a homeless Kansas City man claims firefighters doused him with water from their hose. KANSAS CITY, Mo. 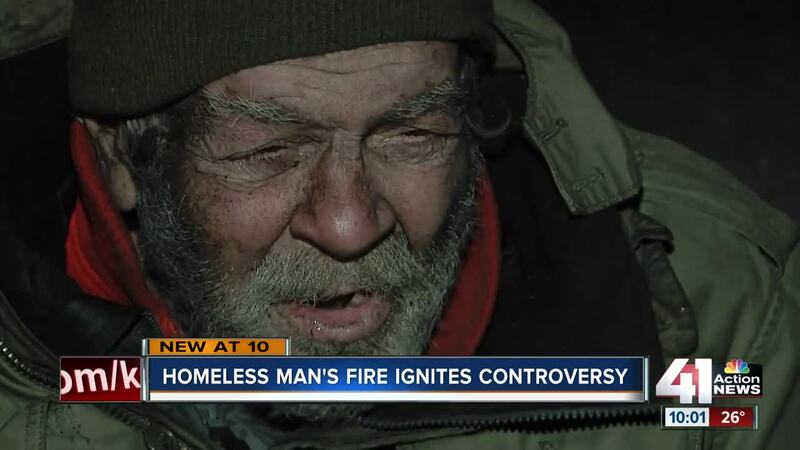 — An investigation is underway after a man who is homeless claims Kansas City firefighters doused him with water from their hose. Phil Bucalo said he had started a small campfire near 20th and Oak Streets in order to stay warm. Around 2 a.m on New Year's Day, he said a firetruck pulled up and put out his fire. "As I was preparing to get [my clothes] [a firefighter] turned the hose on and drenched me, drenched all of my clothes, then there was a pile of wood over there and drenched all of the wood," Bucalo said. The Kansas City Fire Department admits a crew put out a fire after receiving a phone call from police. Deputy Chief Jimmy Walker said although an investigation is pending, he does not believe crews would intentionally douse someone with water. "We try and remove people from these situations," he said. "Us as firefighters, we live in the neighborhood and we want to maintain a good relationship with them. Honestly we don't care if someone lives in a $10 million home or a cardboard box, we treat everyone the exact same because that's our job." The fire department is conducting an investigation, which will include speaking with the firefighters and police officers on scene that night. According to Walker, the department takes fires seriously no matter the size. A fire at a camp for people who are homeless damaged the Beardsley Road Bridge over the summer, which caused the road to close and cost $2 million to repair.